I write this blog based on reflections from a global health conference I attended recently, but the issue of gender (in)equality has also been weighing on my mind for some time now. Gender equality and equity – we refer you to some literature for the intricacies of the terms – can enable us to create a society wherein each individual enjoys equal opportunities, rights and obligations. And early on in this blog, I would like to clarify that for the sake of this blog post I am referring to gender within the binaries of male and female. Gender equality is intrinsically linked to sustainable development and vital to the realization of human rights for all. Gender inequities, as one report tells us, can for example damage the physical and mental health of girls and women. Many of us working in global health and social development are familiar with the literature and discourse on gender and its role in the wellbeing of entire populations. And yet, attending some sessions on gender at the Fourth Global Symposium on Health Systems Research in Vancouver (HSR 2016) got me [as a male participant] thinking – where are the men? Much better publicized than a health systems research conference were the recent worldwide Women’s Marches. A recent blog on a Women’s March in Geneva urged us [men] to join the demand for equal dignity and rights, irrespective of gender. And indeed, the marches saw people come out in astounding numbers the day after Trump’s inauguration – yet, among the marching masses, men were still a minority. And so I raise the question again: where are the men? And if we speak of gender inequalities, why are only women – who are the ones at the receiving end of the inequities – alone in their efforts? 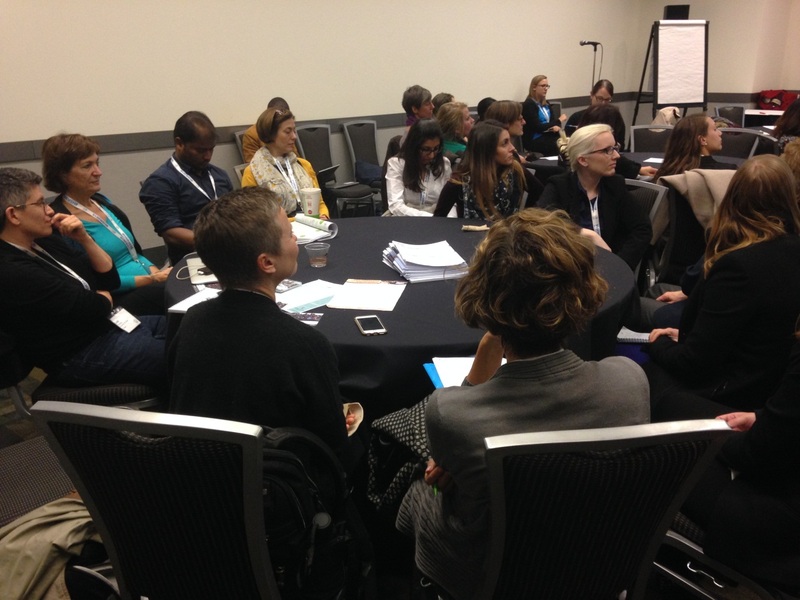 The session on power and prejudice at the HSR2016 started with participant discussions on three main issues: women’s participation in global health programs, health research, and the health workforce. We were asked to share individual and community experiences of women’s roles in these three areas in order to identify barriers in the participation of women in leadership roles, and to come out with possible solutions to tackle issues associated with women’s leadership in global health initiatives. Alas, there were only two men in the room: my colleague and I. For a brief moment we wondered if we had come to the wrong session (one not related to the conference at all) or whether we had overlooked some crucial [read: gender barrier] eligibility criteria for that particular session. At the very least it appeared as though men did not have a role in discussions on the dignity, rights and equity in gender context. And this was among a relatively progressive and liberal community of health policy and systems researchers! Indeed, one can argue that the session may have faced stiff competition from other concurrent sessions, but I don’t believe that is a legitimate reason. It was a great pity! Today even as we have greater representation of women in the health workforce inequities are evident as in most (if not all) countries women tend to take on more “caring” roles of nursing, community health workers and as home carers, whilst their numbers in other healthcare cadres, particularly at leadership positions are still low. We wonder even if in some of our low-resource settings, if it actually were men in community health worker positions such as the Indian ASHAs, whether they would have better salaries, career pathways and designations; or whether their work would be considered as voluntary or instead recognized as being an indispensable part of the health workforce. The need for gender equity is crystal clear, as well as the need for more women in leadership positions. Yet, it’s also obvious that women’s representation should go further than their mere presence at panels, leadership roles etc. True empowerment and equity will come from equal participation of men and women in addressing challenges and barriers to protecting dignity, rights and political participation. The gender debate takes place against a worrying and rapidly deteriorating international backdrop. Surely these are troubled times – with the unity, rights, equity and gender agendas increasingly threatened by nationalism, and intolerance towards vulnerable populations, including women and minorities. It was heartwarming and much needed to hear Hillary Clinton say, earlier this week, that “the future is female”. Despite everything. But men need to say this too, they need to come out in support of women (and female leadership). Men and women must speak out collectively against the glaring and growing injustices all over the world. Discussing gender equality beyond economic, political and educational boundaries should be the first step. Since the inequities among the sexes are so wide and deeply embedded, efforts to push women ahead, to narrow, if not close the gender gap are more urgent than ever today. As a male member of society, I feel more men should also be encouraged to join the efforts currently in place. Self-reflection on our own power and privileges as men is a must before we start anything. Last but not least, we need to bring about social change, as individuals, researchers, policy makers, implementers – among ourselves, among societies and within our smaller workspaces. As a start, I certainly hope I’ll see many more men present at the sessions on gender in Liverpool!